I’ve gotten my hands on a couple of HQ comics that I’m adding to my list of raws: Forgotten Love and Heidelberg Wedding. Forgotten Love raws have watermarks and the height of the pages is about 824px. I’m excluding the French scanlation teams for Heidelberg Wedding raws, but scanlation groups in other languages can send me a request. The height of the pages is a little over 2150px. Why this choice of ignoring the French teams’ requests for Heidelberg Wedding raws? The scans are there if you know where to search in the Internet. It’s not like you can’t get the raws by any other means than through my site. I’ve recently bought the 4 and only HQ comics paperbacks published in French in 2007. They went out of print only a few months after their releases. The sales were too weak so the publisher dropped the HQ manga imprint in France. 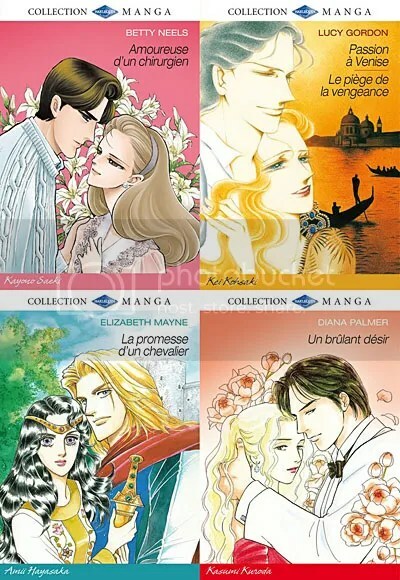 But the fact is that official French versions of those 4 books do exist. Thus, scanlating them in French would be redundant now. And Heidelberg Wedding/Amoureuse d’un Chirurgien is one of them.